As the complexity and degree of complains among students on campuses grow, a well-structured software with a good database will have to be utilized to aid lecturers and school authorities fight this trend, a computerized complaint system will offer a solution on this issue. This software is set up in order to meet the complaints submitted by students, which is handled by the appropriate body. The software is divided into three different sections: Student Login, Student Register, and The Administrator Session. 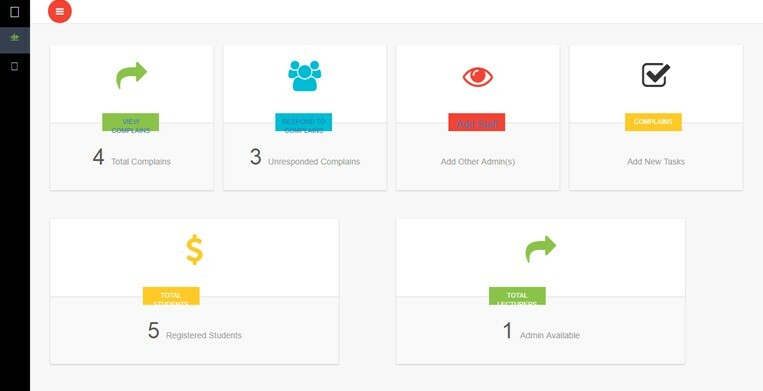 The Complaint record gives information on any complain submitted by the user (the student) which can be viewed by the Administrator which takes the complains to the appropriate school authority. 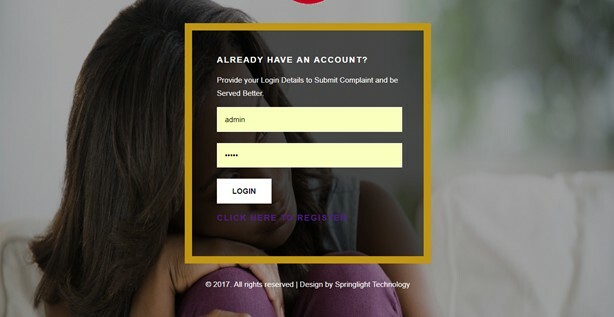 The Student Login requires the student to log into the software to be able to lay a complaint; The Student Register is a form to collect the students’ information before he or she can use the system; The Administrator is the one in charge of the system to access all the submitted Complaints. 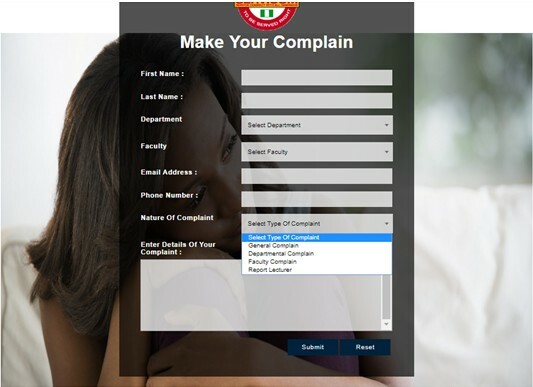 The aim of designing this software is to model a computerized complaint system to enable students submit complains or any wrong doing on the campus, to be handled by a professional administrator who will send the complaints to the appropriate body. The computer has become widely accepted as an assistant that is exceptionally competent and well defined. Now researchers have developed an entirely new kind of tool of computer that serves as an assistant whose skills include finding reasonable solution to problem for which there may be no hard and fast “right” answers. It should come as no surprise, then, that almost all the task that could be solved manually, can now be solved with just a click of the computer keyboard. At this point one can say that a complain system is a software that uses modern day web tools to collect students’ complaints and store it in the same way a human expert will save a complain about no light at the hostel or how a lecturer plans to extort money from them to pass a course. This software will be designed in such a way that it can listen to students’ medical problems. A computerized complaint system can generally collect complaints, store them and these records are collected by the appropriate authority and then decide on the next step to be taken in solving the issues. Traditionally, computer software uses an algorithmic or procedural approach to problem solving; in other words’ it uses a rigid step-by-step approach. Thus, its system has been developed with the best tools to be able to hold the students’ data and this said data can be retrieved anytime. During the analysis and data collection of this project, it was discovered that there existed a manual form of collecting and storing students complains in other for them to be attended to, and for future purpose by the Students Affairs Department of the University of Uyo. That is to say that the process of daily task and activities are done manually which is quite unfortunate; manual procedural for complains execution delays and reduces result output quality. Time wastage and long quarries. Partial or total loss of file or documents. Under recording of criminal analysis. Inefficiency of some members of staff due to laziness in searching of the files. As a result of these problems, the manual system of complains record information storage, input and retrieval is very clumsy: inefficient and unbelievable. To develop computerized complaint software to carryout tedious work and activities performed by human beings, in which they end up misplacing and discarding some important files and students records. But if this (computerized complain system) is installed it will render remedy to this case. To design a web based complaint system record and information system to replace some extent of human role in cases of unavailability of job. To provide quick responds to students complains on campus. 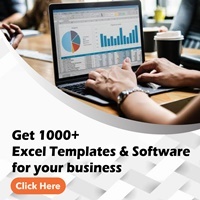 Also, the purpose of this software is to model a computerized complain system to enable proper complain submitting and control. The scope of this project is limited to the Students Affairs Department of University of Uyo. These complains include: hike in school fees and other changes, Lecturer’s harassment, fire-outbreak, murder, stealing, armed robbery, and other ones you will find in the project as time goes on. To fully understand what the study is all about, important and dispensable terms have been chosen and due definition given to them. - Computer: This is an electronic device operated under the control of instruction stored in its memory unit which can accept and store data for future use as well as produce output from the processing. - Manually: Done, Operated, Worked, e.t.c by the hand or hands rather than by an electronic or electrical device. - Complaints: an expression of discontent, regret, pain, censure, resentment, or grief; lament, faultfinding a cause of discontent, pain, grief e.t.c. - Computerized: To control, perform, or store (a system operation or information) by means of an electronic Computer. - Complain Record: Complain record and complaint proceedings are concerned with expression of discontent, regret, pain, censure, resentment, or grief; lament, faultfinding a cause of discontent for which guilty individuals report to appropriate authorities for proper results. Therefore the objective of complaint proceedings are to determine the cause and solutions of the reported issues, if the issue is found to be a wrong doing, the wrongdoer must be punished and protect the school community, and rehabilitate the offender. - INEFFICIENCY: the state of not achieving maximum productivity; failure to make the best use of time or resources. - INFORMATION STORAGE: Information storage is an act of a system that keeps data accessible to the information processors; the information storage unit is either a hard drive or a server that usually contains a database. - RETRIEVAL: the action of obtaining or consulting material stored in a computer system. - ALGORITHMIC: A finite set of unambiguous instructions performed in a prescribed sequence to achieve a goal, especially a mathematical rule or procedure used to compute a desired result. Algorithms are the basic for most computer programming.